While many desire the latest new technology, what are the environmental and human costs of the widespread consumption of portable media devices? 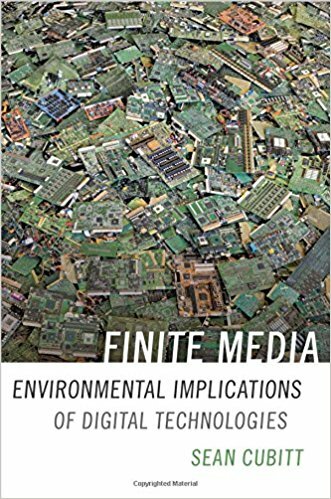 In Finite Media: Environmental Implications of Digital Technologies,Sean Cubitt examines the ecological toll of the manufacture, use and disposal of phones, computers and other items, and advocates ‘an eco-political media aesthetics’ in response. This insightful book is replete with illuminating examples and case studies, with subtle arguments that will likely prove prescient in years to come, writes Niall Flynn. Finite Media: Environmental Implications of Digital Technologies. Sean Cubitt. Duke University Press. 2017. We desire the latest mobile phones. We expect to be contactable and connectable at all times: wherever we go, our portable media devices come too and probably record each step of the way, either intentionally or otherwise. Yet how often do we think about the underlying consequences of these expectations? For instance, when was the last time you connected to Google search and thought of its environmental impact? In Finite Media: Environmental Implications of Digital Technologies, Sean Cubitt considers these issues and does the hard work of digging up answers and figures: each Google search emits 0.2 grams of C02 (18). When we add the energy required by server farms to the demands of domestic and office equipment usage, and to them the energy costs of extracting materials, manufacturing digital equipment, and recycling it, we begin to understand the scale of the environmental footprint proper to digital media (35). The ecological theme builds upon recent interest in the topic from authors like John Durham Peters and Jussi Parikka who are expanding the remit of media studies beyond its traditional textual basis. However, while other works sometimes celebrate the media-as-ecology interpretive metaphor, Cubitt exposes the messy and exploitative realities that underlie it. For Cubitt, these reveal the political character of all media. Finite Media directly addresses media’s imbrication with the environment, which has been a key theme in Cubitt’s work on communications, media art and aesthetics in previous books including EcoMedia (2005) and The Ecocinema Reader (2012). In the introduction, Cubitt outlines two key claims: that the earth has finite resources and mediation depends on their limits; and that ecology consists not only of we call ‘nature’, but also of the ‘secondary environments’ of mediation and technology (11). These are addressed in various ways in Finite Media: initially through engagement with media’s empirical environmental consequences, and in the final third of the book through a more speculative, philosophical perspective with reference to Karl Marx and Martin Heidegger and the philosophy of human rights and citizenship. Finite Media is replete with examples and case studies and engages a wide range of topics, including the ‘cyborg’ logic of large corporations’ inhuman pursuit of wealth; server farms and data centres; digital labour; the restructuring of consumerism; energy use and sources; the burden on the world’s poor and indigenous peoples of western media consumerism; and the failure of political actors to address ecological issues in the face of catastrophe. Broad reading and engagement across disciplines is evident in the way Cubitt utilises these themes in his book: indeed, this synthesis is necessary for a project with such wide remit. In Chapter One, Cubitt offers an insightful case study of uranium’s role in mediation. Digital media allow us to expand our communications manifold: we generate more and more data in a wanton manner, using more power as we do so. The more abundant, cheap energy we have, the more we use it (47). This paradoxical (mis-)use of resources creates huge waste disposal issues. Two examples Cubitt provides are the sole nuclear waste plant in the United States, located in New Mexico, which is planned to be sealed off within 75 years, and the Ranger Mine in Australia’s Northern Territories, which is seen to pose direct threats to local populations and heritage, as reported by the Australian Senate. Cubitt shows that energy is treated differently around the world. Waste is not only a byproduct of global capital, but an integral part of it. In both these cases, however, indigenous peoples are the losers as the plants are located on Navajo and Aboriginal lands, respectively. 70 per cent of the world’s uranium supplies are located under indigenous lands (51), which means that the potential for political activities to resemble colonial tactics remains a real risk. The Australian government were found to have breached UN Human Rights Commission charters on racial discrimination through their actions in the Northern Territories. Similar actions by governments at other sites of uranium resources also threaten indigenous populations in Greenland, Kenya, Tanzania and Mongolia, among others (52). In the pursuit of cheaper energy, what were once common lands have become the private property of corporations that disavow responsibility towards peoples inhabiting these sites. All of this serves the needs of the digital economy and the corporate logic of profit due to uranium’s powering of diverse media systems such as fibre optic networks and telecommunications satellites. For Cubitt, materialist ecocriticism of media must realise these implications even as it abandons human-centric forms of analysis (58). While the book outlines the massive environmental consequences of our use of media, the answer to these issues is not to divest from media use, as if the relation between humans and technology could ever be unfurled. Instead, Cubitt thinks that we must foster an alternative practice of media: an ‘eco-political media aesthetics’. In the final third of the book, the register shifts from accounting for the data and its consequences to offering a response in terms of ecological communication. The arguments come thick and fast in this section, and there are important ideas presented. Media are characterised by radical difference as opposed to the integrated image put forward by capital and free markets. Society, economy and polity are abstractions that have failed us. Communicating through difference is the goal of ecological politics and aesthetics. However, the self can no longer be the source of political action. Diverse communities of the human and nonhuman are the goal: ‘The fundamental political task is to build a communicative event embracing the whole world, not just the human’ (184). To foster sustainable media practices and to act in alternative ways to informationalisation, group formation must replace individual action. Claims about the digital are often hyperbolic. Cubitt carefully sifts through his topics to show realities beyond their generalisation. Instead of assuming that media use and its consequences are the same the world around, Cubitt exposes shocking disparities that disproportionately affect peoples at the poorer end of the spectrum. Indeed, postcolonial theory is an important reference point in the book. It is an all-too-rare use of this resource that media studies should draw upon more often to live up to its interdisciplinary reputation and claims. The environmentalisation of data explored throughout the book is not, readers realise, something to be celebrated: rather, it is an unsustainable process borne from the contradictions of capitalism. For Cubitt, capital is the great mediator: everything is subsumed under its sign. Capital plays an inextricable role in geopolitical issues and due to this, whole sections of the world population are becoming economic externalities, becoming environmental. It is hard to appreciate the subtleties of all of Cubitt’s arguments on first reading Finite Media. Nonetheless, I have no doubt that further exploration of media’s role in capital and the overdeveloped world in the years to come will show their prescience. Niall Flynn is a PhD candidate at Lincoln School of Film & Media, University of Lincoln, with a thesis exploring alternatives to contemporary connectivity in media aesthetics, methods and infrastructures. He has published articles in Open Library of Humanities (https://olh.openlibhums.org/articles/10.16995/olh.14/) and Networking Knowledge (http://ojs.meccsa.org.uk/index.php/netknow/article/view/409). He welcomes correspondence at nialljf@gmail.com. Read more by Niall Flynn.